The Seokguram Grotto is a hermitage and part of the Bulguksa temple complex. It lies four kilometers east of the temple on Mt. Tohamsan, in Gyeongju, South Korea. It is classified as National Treasure No. 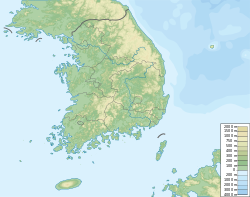 24 by the South Korean government and is located at 994, Jinhyeon-dong, Gyeongju-si, Gyeongsanbuk-do. The grotto overlooks the Sea of Japan (East Sea) and rests 750 meters above sea level. In 1962, it was designated the 24th national treasure of Korea. In 1995, Seokguram was added to the UNESCO World Heritage List together with the Bulguksa Temple. It exemplifies some of the best Buddhist sculptures in the world. The Seokguram grotto is said to have been built by Kim Daeseong and originally called Seokbulsa (석불사, Stone Buddha Temple). Construction began in 742 when Kim Daeseong resigned his position in the king's court or in 751, the 10th year of the reign of King Gyeongdeok of Silla. This time period was the cultural peak of Unified Silla. The grotto was completed by the Silla court in 774, shortly after Kim's death. An old legend stated that Kim was reincarnated for his filial acts in his previous life. The legend relates that the Bulguksa Temple was dedicated to Kim’s parents in his present life while the Seokguram Grotto was dedicated to Kim's parents from a previous life. The grotto is currently one of the best known cultural destinations in South Korea. A viewing of the sunrise over the sea, which is visible from near the seated Buddha's perch, is especially popular. The tradition of carving the image of Buddha in stone, holy images, and stupas into cliff walls and natural caves began in India.[when?] This practice was transferred to China and then Korea. The geology of the Korean Peninsula, which contains an abundance of hard granite, is not conducive to carving stone images into cliff walls. Seokguram is an artificial grotto made from granite and is unique in design. The small size of the grotto indicates that it was probably used exclusively by the Silla royalty. The Seokguram grotto is symbolic of a spiritual journey into Nirvana. Pilgrims were to start at Bulguksa or at the foot Mt. Tohamsan, a holy mountain to the Silla.[when?] There was a fountain at the entrance of the shrine where pilgrims could refresh themselves. Inside the grotto, the antechamber and corridor represented the earth while the rotunda represented heaven. The basic layout of the grotto includes an arched entrance which leads into a rectangular antechamber and then a narrow corridor, which is lined with bas-reliefs, and then finally leads into the main rotunda. The centerpiece of the granite sanctuary is a Buddha statue seated in the main chamber. The identity of the Buddha is still debated. The Buddha is seated on a lotus throne with legs crossed. The Buddha has a serene expression of meditation. The Buddha is surrounded by fifteen panels of bodhisattvas, arhats and ancient Indian gods in the rotunda and is accompanied by ten statues in niches along the rotunda wall. The main hall of Seokguram houses a Bojon statue Bodhisattva and his disciples. Forty different figures representing Buddhist principles and teachings are in the grotto. The grotto was built around these statues to protect them from weathering. The ceiling of the Seokguram grotto is decorated with half moons; the top is decorated with a lotus flower. Silla architects used symmetry and apparently employed the concept of the golden rectangle. The grotto is shaped by hundreds of different granite stones. No mortar was used in its construction; the structure is held together by stone rivets. The construction of the grotto also utilized natural ventilation. The dome of the rotunda is 6.84 meters to 6.58 meters in diameter. The main Buddha of the grotto is a highly regarded piece of Buddhist art. It is 3.5 meters in height and sits on a 1.34-meter tall lotus pedestal. The Buddha is realistic in form and probably represents the Seokgamoni Buddha; the position of the Buddha's hands symbolizes enlightenment. The Buddha has an usnisa, a symbol of the wisdom. The drapery on the Buddha, such as the fan-shaped folds at the crossed-legs of the Buddha, exemplifies Korean interpretations of Indian prototypes. Unlike other Buddhas that have a halo attached to the back of the head, the Buddha at Seokguram creates the illusion of a halo by placing a granite roundel carved with lotus petals on the back wall of the rotunda. The pedestal is made of three parts; the top and bottom are carved with lotus petals while the central shaft consists of eight pillars. Accompanying the main Buddha, in relief, are three bodhisattvas, ten disciples, and two Hindu gods along the wall of the rotunda. Ten statues of bodhisattvas, saints, and the faithful are located in niches above the bas-reliefs. The ten disciples were disciples of Seokgamoni and are lined five on each side of the Avalokitesvara. Their features suggest a Greek influence. The two bodhisattvas are of Manjusri and Samantabhadra. The two Hindu gods are Brahma and Indra. The Four Heavenly Kings guard the corridor. There are also images of Vajrapanis, which are guardian figures and they are on the walls of the entrance to the corridor, in the antechamber. Eight Guardian Deities adorn the antechamber. Another notable figure is the Eleven-faced Avalokitesvara, the Bodhisattva of Compassion. It is on the back wall of the rotunda and stands 2.18 meters in height. This figure is the only one of the bas-reliefs facing forward; the others face the side. The Avalokitesvara wears a crown, is dressed in robes and jewelry and holds a vase containing a lotus blossom. Two statues from the niches and a marble pagoda that was believed to have stood in front of the Avalokitesvara are missing from the grotto and are believed to have been looted by the Japanese. Because of the long periods of abandonment and numerous renovations, many details are disputed amongst scholars, such as the exact layout of the original grotto, the buildings in Bulguksa or the shape of the watercourse, which no longer exists, in front of the temple. Repair and improvements were undertaken in 1703 and 1758, during the Joseon dynasty. However, Confucian-oriented rulers suppressed Buddhism, and the remote mountain grotto was seriously damaged by the turn of the 20th century. The Government-General of Chosen conducted restoration works three times, but faced humidity and other problems. Japan did the first round of repairs from 1913 to 1915. These repairs were conducted without sufficient study of the structure of the grotto. During Japanese cleaning efforts, the structure of the grotto was almost completely dismantled and reassembled. A major mistake committed by the Japanese was their attempt to stabilize the structure by encasement in concrete. This resulted in humidity buildup and in water leaks, and caused erosion of the sculptures because the grotto could no longer "breathe." In 1917, drainage pipes were buried above the dome to channel rainwater away from the grotto. However, as leaks continued in spite of the pipes, another round of repairs was conducted from 1920–1923. Waterproof asphalt was applied to the surface of the concrete, which only worsened the problem. Moss and mold formed, and in 1927 the now unthinkable method of spraying hot steam was used to clean the sculptures. After World War II, in the 1960s, President Park Chung Hee ordered a major restoration project. The problem of temperature and humidity control was resolved to an extent by using mechanical systems. The wooden superstructure built over the antechamber remains a subject for debate for many historians who believe Seokguram originally did not have such a structure blocking the view of the sunrise over the ocean, and cutting off the air flow into the grotto. The interior of the grotto can now only be viewed through a glass wall, installed to protect it from the many tourists it attracts, as well as temperature change. The entrance to the grotto. The rotunda is covered by a grassy hill in the background. The sea can be seen from the grotto, and it is hypothesized that the Buddha was made to protect the Silla kingdom from attacks through Wa (Japan). The entrance to the grotto; the giant seated buddha is located inside. Wikimedia Commons has media related to Seokguram. ^ "Seokguram Grotto [UNESCO World Heritage] (경주 석굴암)". ^ "South Korea in Pictures". ^ "Treasures of the Dragon". ^ "K-architecture: Tradition Meets Modernity". ^ "Sculptures of Unified Silla: 통일신라의 조각". ^ "1000 Buddhas of Genius".